In another episode of Kickstarter Unboxed, we talk with indie game developer Chris de Castro who shares five big learnings of crowdfunding wisdom about his successful Kickstarter campaign with his indie game "The Wizards of Trinity Bellwoods". 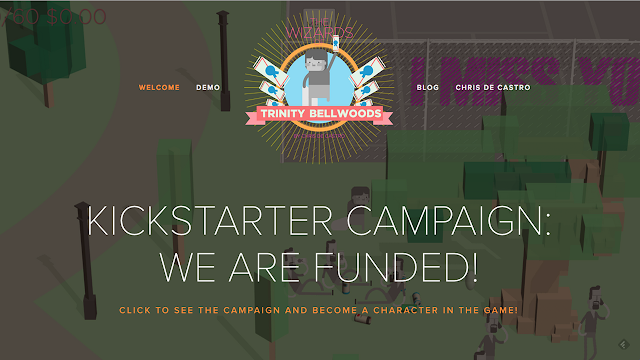 Check out below what Chris can share with other indie game developers on crowdfunding. Chris recommends making sure the game's pitch is understood. Answering the What?, Why? Who? when? How? can help you frame the pitch correctly. Chris put some thought on what the game is?, what platforms is the game targeted for?, why is he doing it?, who is the target audience?, when will the game launch?, how is the user going to sign up?, how is the user going to get the game? are just a few questions he contemplated prior to starting his campaign. During this time, the creation and planning of your intro video can be important especially for games. Chris recommends starting weeks, even months in advance of the start of the campaign. He did it the guerrilla marketing way and just engaged people in the park that his game was set in. There are other ways like Prefundia but if your pitch is still in progress it still may not be as sticky as starting your own landing page and promoting it with Twitter and Facebook. Another way, can be enlisting a PR agency who has experience with your product and can help launch it. Chris recommends making sure you convert contacts into a mailing database. Mailchimp, Vertical Response or others are email marketing programs you put your contacts in and keep in contact with them as well as have them spread the word about the game. Like our other Kickstarter interviews, Chris recommends devoting time, a lot of time, towards communicating with interested people or funders in Kickstarter. Populating the Project FAQ area is a great way to manage common questions. Chris stated that if you want to engage with partners and brands that would be great as sponsors a lot of key decision makers are on vacation during the summer. Another concern he mentioned, a lot of the audience is checked out during the summer vacation.